Rock climbing was once only enjoyed by those with unbelievable daring and high tolerance levels. Today, all this has changed, with proper equipment and great instructors. And we’re all the better for this, as India is a country that is blessed with an amazing variety of terrain. If you are looking for the best places for rock climbing in India, this article is for you. It features thrilling places for adventure seekers to enjoy a rock or mountain climbing in India. This valley is blessed with a rocky terrain and that is why it is the preferred choice for trekking and rock climbing in Himachal. The hills are surrounded by beautiful meadows, adding to the fun of rock climbing. The Parvati Valley is a popular spot for mountain climbing and many people from India visit. 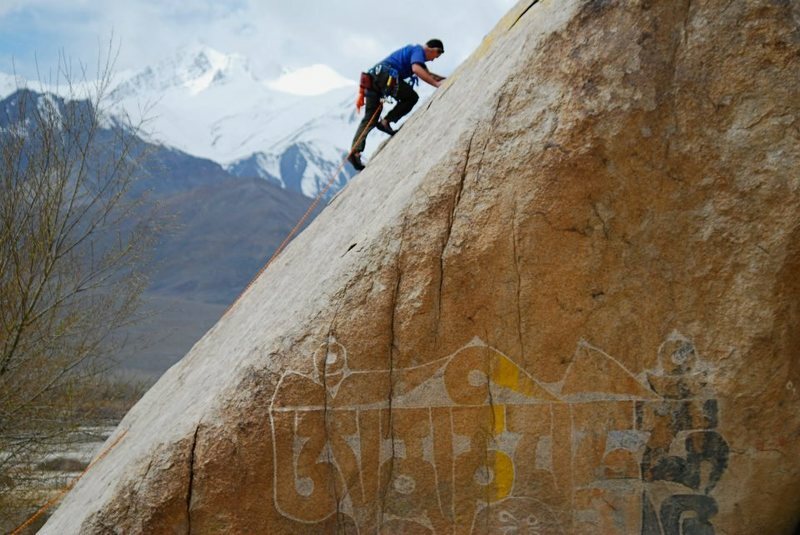 Located close to Leh, the Shey Rock is one of the best spots for rock climbing in the Kashmir region. At the Shey Rock, you will find around 20 bottled sport routes that are ideal for climbing. Difficulty levels range from easy to moderate and the safety facilities provided are top-notch. The Hiram Crack is the best place for rock climbing at the Shey Rock. The scenic surroundings and the thrilling challenge makes rock climbing at the Miyar Valley interesting. Mountain or rock climbing at the Miyar Valley is ideal for both amateurs as well as experienced climbers. Add to the fun by visiting the Valley of Flowers that is located nearby. The Sar Pass is a rather popular spot for mountain climbing and trekking. Offering beautiful, panoramic views of the hills, at the Sar Pass you can climb up a variety of rock formations. Difficulty levels vary and from the top of the rocks, you can view stunning landscape views of the hills. The Damdama Lake lures tourists because of its beautiful surroundings. While most of the tourists visit to enjoy a day out in nature’s company and do bit of boating on the lake, there are a few daring ones that attempt rock climbing. For the past few years, rock climbing has gained popularity. Besides rock climbing, adventure sports enthusiasts can enjoy rope bridge crossing and a few other adventure sports. Malshej Ghat is a tourist destination that is great to visit during the monsoon. Many from the state of Maharashtra and neighbouring Goa visit for a short holiday. Not many know that Malshej Ghat is a great spot for adventure sports, including rock climbing. During the tourist season, many adventure camps have rock climbing sessions for amateur and moderately skilled rock climbers. Even those that haven’t tried their hands at rock climbing can enjoy the sport in Malshej Ghat. Located just about 50 kilometres away from Bangalore, Ramanagara is a happening place for adventure sports and rock climbing. On the weekends, you will often find Bangaloreans heading here to try their hands at rock climbing. During the tourist season, which is usually from September to February, you will find foreigners coming to Ramanagara to enjoy mountain climbing. The difficulty level here ranges from moderate to difficult. The best part about rock climbing in Madhugiri is the various rock formations. The place offers rock climbers the chance to climb different types of rocks. From amateurs to professionals, you can see all types of rock climbers visiting Madhugiri. There is a beautiful old temple around the place that is well worth exploring. Hampi in Karnataka is a famous temple town. Many tourists often visit to tour the wonderful temples and get the feel of Indian culture. While most tourists come here to visit the temples and religious sites, there are some who come here for adventure sports. Hampi offers one of the best rock climbing experiences in Karnataka. There is nothing like climbing rocks in the picturesque Savandurga hills. Visit the place to enjoy rock climbing at Asia largest monolithic rock formation. It does not matter whether you are a beginner or a professional rock climber, you will have fun here. Additional adventure sports to enjoy in Savandurga are rappelling and trekking. Situated on the outskirts of the Kappimala village, Pythal Mala is a nice spot for rock climbing. Serene and gorgeous, the place has interesting rock formations. Rock climbing expeditions are conducted yearly at Pythal Mala. The Lado Sarai Old Rocks lie near the Qutub Complex in Delhi. This is one of the few spots in India that is ideal for amateur rock climbers. The rocks are flat, so it is not that difficult to climb. Rock climbing is held every Sunday here and prior booking is needed. India has excellent spots for rock climbing in the North and South. Most of these are conducted under secure environments by experts who are highly skilled. While some offer on-the-spot registrations, there are others that require you to register for a spot. Do you love going rock climbing? Have you ever done it before? What was your experience? Do share them with us in the comments section below.